Note: Please confirm the model year, size and shape of the center console panel before purchasing. And contact our customer service first if your car is beyond the scope of application. [Strong Operation System]: The FIA Formula 1 World Championship is coming,just buy the car stereo for the best gift! New Android 7.1 OS, 2GB RAM, Quad-Core, 16GB ROM (Supports USB flash drive, MP3 player and Micro SD card with up to 64GB of storage) and provides a high speed of response and more fluent experience. [Great Performance]: The car audio can split screen mode allows running two apps side by side at the same time. 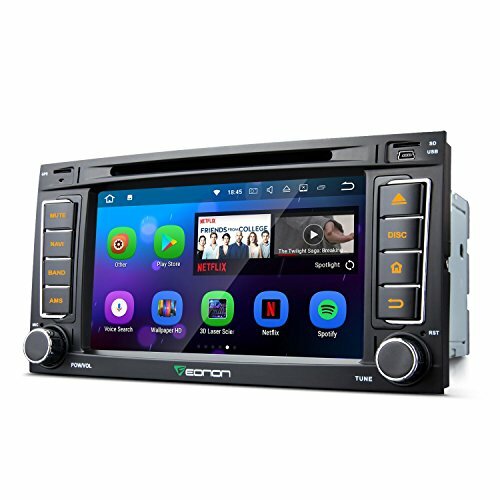 It can support Bluetooth, WiFi Connection, 1024x600 HD screen, video output, Subwoofer output volume is adjustable, and you can adjust the volume as you want. [Applicable Car Models]: Perfect fit for your VW Touareg (2004,2005,2006,2007,2008,2009 and 2010)/VW T5 Multivan (2004,2005,2006,2007,2008 and 2009)/VW Transporter (2004,2005,2006,2007,2008 and 2009). [Excellent Car GPS Navigation]: Navigation can be achieved by using the online, offline map or purchasing a map card. It can quickly run all navigation apps like Google Maps, Waze ,etc. [Hands-Free Calling and Audio Streaming]: Bluetooth wireless technology helps you play music from phone and make hands free calling while driving. The car radio also supports searching contacts rapidly. If you have any questions about this product by Eonon, contact us by completing and submitting the form below. If you are looking for a specif part number, please include it with your message.